In-plants have a long history of embracing digital printing technology. Ever since digital printing was introduced, in-plants have been steadily transitioning from offset presses to toner-based digital printers. In today's world, as production inkjet technologies have improved, the in-plant world has pursued adoption. At the same time, their use of wide-format inkjet technologies has greatly expanded. 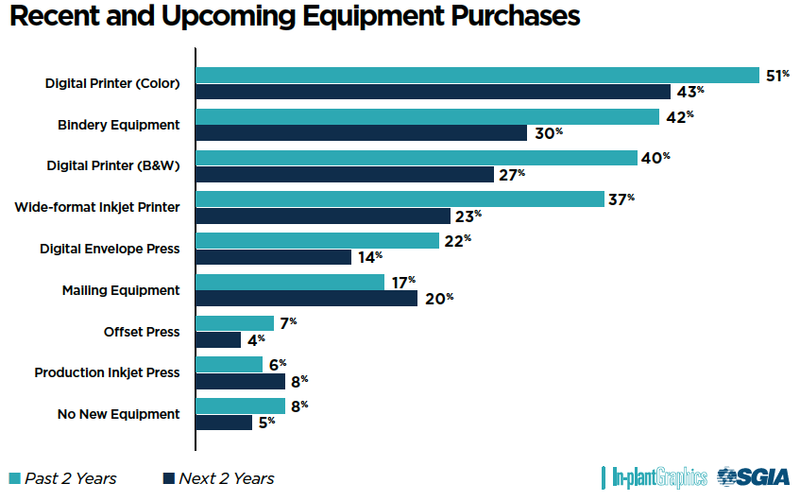 These are some of the findings of a brand new In-plant Graphics research report title "Equipment Investment Trends in the In-plant Industry," which examines equipment investment trends at in-plants. The study, sponsored by SGIA, looks at the technologies in which in-plants are investing to measure where they see the best opportunities for growth. The report's debut comes just ahead of the 2018 SGIA Expo, where the same cutting-edge technologies being investigated by in-plants will be on display from Oct. 18-20 in Las Vegas. Overall, 92% of survey respondents reported installing equipment in the past two years. Digital color printers were the most acquired device followed by bindery equipment and black-and-white digital printers. Nearly a quarter report they are “seriously investigating” adding a production inkjet press. 57% of those who reported they are using or investigating inkjet believe that inkjet will let them offer additional services and applications to customers. More than 70% of respondents have a wide-format printer and 32% of respondents have two of them. Almost three-quarters of respondents reported wide-format volume increases in the past 12 months and one-third said they experienced double-digital volume growth. Trends in other specialty devices show high interest in wide-format laminating and contour cutting. To read the full report, "Equipment Investment Trends in the In-plant Industry," download it here.